The 1st Round: Towns as the now-inevitable #1 pick. Andy G: First off, Happy Draft Week. Whatever this says about us, and the team that we cheer for, this is usually the highlight of our NBA season and a time clearly marked off on our calendars. This is an especially big one, what with the Wolves picking first overall for the first time ever. (Eds note: But this year’s will join the last two top picks on the Wolves roster, who came over in the K-Love trade. Thanks, LeBron!) Also, the Wolves are picking high in the 2nd Round. There’s some question as to whether they’ll keep both picks, or use them on players that will immediately join the NBA, but the fact is they have them and that means more to discuss. I’ve written some things about the Wolves top pick; specifically, whether they should use it on Karl Anthony-Towns from Kentucky, or Jahlil Okafor from Duke. For a while, it seemed like Flip was going to take Okafor, a player he was (reportedly) enamored with all season — possibly to the extent that the possibility of drafting Okafor helped motivate the season’s big tanking decisions, like holding Ricky Rubio out of games for much longer than he had to. But late in the college season, the general scouting consensus (Draft Express and the NBA scouts who talk to Chad Ford) shifted from Okafor to Towns as the draft’s best prospect. The best stats projection models also prefer Towns to Okafor. Now it is widely believed that Flip’s mind has changed as well. There was a period of time when it was rumored that the Wolves personnel staff preferred Towns, but Flip still preferred Okafor. This was disconcerting to read, not because of the conclusion itself (I’m on record as loving Okafor’s potential, and even slightly preferring him to Towns based on what I watched) but because of what it suggested about the team’s structure and process. The draft is less than four weeks away. Yesterday on KFAN Radio with Dan Barreiro, Flip Saunders admitted that he knows who he would select with the top choice if it were held now. Flip made clear that there is more work to be done between now and then, and that the current favorite — whoever he is — may not ultimately be the player that the team chooses with its first ever number one overall pick. The feeling that I and most people have is that Flip currently prefers Jahlil Okafor over Karl-Anthony Towns and D’Angelo Russell. (These three seem to be most people’s top three.) His radio interview did nothing to dispel that feeling. When I last wrote it was about how the team should think about its big choice, along with some specific thoughts about why Okafor may in fact be the better choice for this team. Since writing that, I have had a chance to watch more tape of both Okafor and Towns, and my opinion is only reinforced by that. 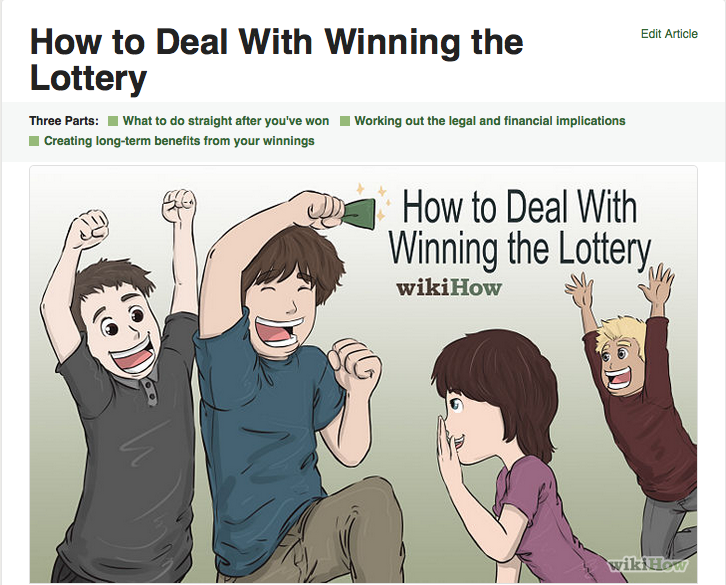 I guess that isn’t surprising since “watching them play” was the driving force behind my initial conclusions. Okafor is simply a more impressive player to watch. At Duke, he was his team’s primary offensive option and showed off world-class post skills. It doesn’t necessarily mean he’s the better player or will be the better NBA player. But it is the “eye test” that makes him seem that way. Towns has a more rigid offensive game than Okafor’s, which is not as fun to watch, or as easy to imagine succeeding in the pros, but he definitely adds value in other, important ways. He has a more impressive body and has more of a presence in the lane as both a defender and defensive rebounder. When combined with his ability to shoot the ball, you can imagine him being a “net plus” type of player who clearly helps on defense and does not hurt — and may even help — his team on offense. I just can’t get over how damn good Okafor is on offense. I try to keep hyperbole to a minimum, but it’s hard to do that when describing Okafor’s ability on offense. For a player that big to handle the ball that well, and have such advanced footwork is just unheard of. If post play as we once knew it is dead, that’s just fine for Okafor because he doesn’t play post like we’ve ever seen. Yes he can score with his back to the basket, but he doesn’t need to. He can square up his man and put the ball on the floor. He’ll use the backboard and whatever spin move makes the most sense to finish around the hoop. The man shot 66 percent from the field as a primary option on his college team. As a freshman. It’s very, very, hard to watch Okafor play, and not get excited about what he’s going to do in the NBA where he’ll only have more room to operate. There is no such thing as a sure thing, and both of these players would be drafted with some risk. With Okafor, the risks are that he never improves to become a solid defensive center, and/or that he never improves a shooter (particularly on free throws). Those are legitimate concerns. Towns has less risk in terms of potential weaknesses. The risk with Towns is that if you draft him, that means you passed on Okafor, who might become an all-time great. This leads to the other thing Flip talked about with Barreiro: his dual job title of President of Basketball Operations and Head Coach. As you’re certainly aware by now, the Timberwolves won the draft lottery on Tuesday night. While they can still complain that they’ve never “moved up” above their odds slotting — that was not technically possible this year, given their league-worst standing — this was the first time they’ve ever been so lucky to win the lotto: They had just a 25 percent chance of landing the top pick and that’s exactly what happened. On Tuesday afternoon we discussed the two basic scenarios that they would face after the ping-pong balls did their thing: they’d either land a Top-2 Pick and select a big man, or they wouldn’t, and their choice would be more complicated and involve a much longer list of names and positions. Barring something very surprising, the Wolves will draft either Karl-Anthony Towns of Kentucky or Jahlil Okafor of Duke. Both will be centers in the NBA, which is a position of need for this team, but not the reason for the choice; along with filling a roster void, Towns and Okafor also project as the best all-around impact players in this draft. It took all of a few minutes for the social-media celebration to shift gears to a “Towns versus Okafor” discussion. It’s clear to me that most fans of the team want the Wolves to draft Towns, but much less clear that Flip Saunders — the team’s president of basketball operations, coach, and minority owner — will heed that collective, outsider input. For a long time it has been rumored that Flip is enamored with Okafor, and his comments on KFAN radio this afternoon did little to dispel that notion. Whatever Flip and the Wolves ultimately decide on June 25, “Towns or Okafor” is sure to dominate Timberwolves discourse from now until then. I read somewhere recently that “to know something entails two things: for there to be no doubt, and for it to be true.” This definition of knowledge is problematic for discussing the draft because certainty levels (for the self-aware, anyway) are so low, and the truth will not be adequately tested for years to come. With full recognition that most people already understand this reality, it sometimes feels like it bears repeating. For the Timberwolves decision maker(s), the obvious question is whether Towns or Okafor will become the better all-around player. Duh. If they could know the answer to that broad question, that would be the end of it. But they can’t know the answer right now, and given how good each player projects to be in the NBA, the decision draws a host of other sub-issues into the analysis. Some are data driven, some are conceptual, some are philosophical, and some are based on imagination. From what I have seen of, and read about these two players, I lean slightly toward drafting Okafor. At this point anyway. I’ll spend plenty more time watching the available videos of each, and reading as much as I can. ESPN and Draft Express always do a great job covering the upcoming drafts, and Canis Hoopus (led by increasingly-well-known Layne Vashro) have had cutting-edge stats projections for years. If somehow you’re reading here and not there, I highly recommend checking it out. My basic reasoning for preferring Okafor is that almost every time I watched Duke play, he stood out as an imposing, primary offensive option who had an unusual command of the halfcourt offense from the post. He has a great feel for positioning himself where he can make a play for either himself or teammates, and once he gets the ball in reasonable position, it seems like close to a foregone conclusion that something good will happen. For a player so big, he has incredible ball-handling ability and footwork. Duncan is the most frequent style comparison, and that’s fair, but Okafor is more advanced at this stage than Duncan was. In my opinion, his offensive skills from the low and extended post positions are at such a high level that any comparison will be faulty. I tweeted last night that comparing Okafor’s post play to others is akin to comparing Steph Curry’s shooting to others, and I stand by that. There are things that Okafor can do that nobody else would be allowed to try, and it makes comparison mostly worthless. He’s going to do things on offense in the NBA that nobody else does, with the possible exception of DeMarcus Cousins who is a superstar offensive player. Towns is a very, very good prospect, too. He is a better defender than Okafor, even if his athleticism might be overrated by some accounts. His upside and appeal has less to do with mobility than it does with his combination of size (he has pure center size, and a frame that looks like it might broaden out into Derrick Favors-territory) and shooting ability. Towns has no obvious weakness and he figures to be a “net positive” no matter his role or situation. Such a high level of certainty that he’ll succeed in some fashion is rare, and he is a safer pick than Okafor for this reason. (Okafor struggled more on defense than Towns, and does not rebound as well.) I lean slightly in Okafor’s favor because I think he has a better chance of being a special, high-impact player who plays offense so well that he can be relied on to create plays not only for himself but others. Basically, I think Okafor has a higher chance of being a superstar in the traditional sense of the term which might’ve been overrated at one time, but is still the most important factor in building a championship-caliber roster. But like I said, my certainty about Towns vs Okafor is low, and yours should be too. 1) Should the Wolves decision be affected by the makeup of their current roster? Hi again, I’m Jon W. You might be familiar with me from Part I of this series, on Jahlil Okafor’s NBA prospects, or from the post I wrote here a while back in which I compared and contrasted John Wall and Ricky Rubio. Please excuse my brief indulgence into the draft and NBA career prospects of the Duke early entry candidates from an unabashed Duke homer. This team has been one of my favorite sports teams to follow in my lifetime so there is no way I can be unbiased in the evaluation of these three players. That said, I will try to give you my honest and candid opinions as to the strengths, weaknesses, and NBA prospects of Jahlil Okafor, rising prospect Justise Winslow, and Minnesota native Tyus Jones. There’s bigtime interest in these guys in Timberwolves circles–and for good reason. 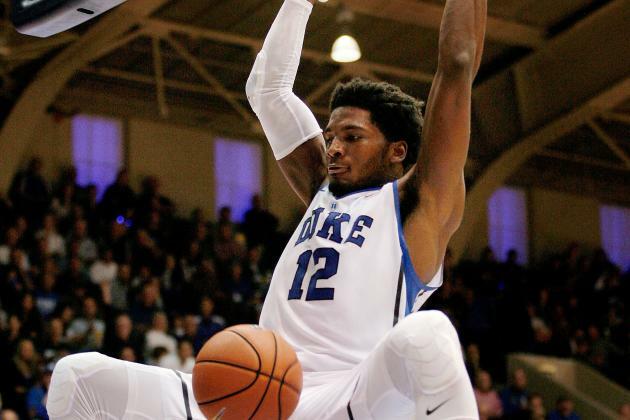 I’ll spend this post on Winslow–who is the most athletic of the three and is projected to go as high as fourth overall. Part III of this series will be on Tyus Jones. Read on below the fold for more on Justise Winslow. Hi, I’m Jon W. You might be familiar with me. Please excuse my brief indulgence into the draft and NBA career prospects of the Duke early entry candidates from an unabashed Duke homer. This team has been one of my favorite sports teams to follow in my lifetime so there is no way I can be unbiased in the evaluation of these three players. That said, I will try to give you my honest and candid opinions as to the strengths, weaknesses, and NBA prospects of Jahlil Okafor, Minnesota native Tyus Jones, and rising prospect Justise Winslow. There’s interest in these guys in Minnesota. Tyus Jones on a possible reunion w/ Okafor w/ the #Twolves: "If that were to happen, & in Minnesota, that would just be the cherry on top." This is for good reason. I’ll spend this post on Okafor–who is the most realistic future T-Wolves player, and the best prospect of the three. My next two posts will be on Jones and Winslow. Inevitably, then, some of us begin thinking about the draft, and looking at the best college players, in hopes that one of them can help Andrew Wiggins and company resurrect this franchise that reached the playoffs every year from 1997 through 2004. Also, in case you missed it, Jahlil Okafor of Duke is the most touted prospect in the anticipated 2015 draft class. He has size, listed on Draft Express at 6’11” and 272 pounds. His wingspan is 7’6″ and his standing reach is 9’3″. For a helpful comparison, consider the measurements (in DX’s awesome database) of DeMarcus Cousins, the league’s most dominant low-post force (by far): Cousins, as a prospect, measured at 6’10.75″, 292 pounds, 7’7.75″ wingspan and 9’5″ standing reach. If Boogie is physically overwhelming in the NBA at that size, Okafor — slightly taller, slightly leaner, with slightly shorter arms, will be plenty big to play as a low-post center. But it is skill where Okafor stands out when you watch any Duke game. I’ve seen a handful, and without exception have come away impressed every single time. Put simply, he has the most advanced low-post game that I’ve seen in an NCAA center since Tim Duncan. He’s currently averaging 19 points per game on 68 percent field-goal shooting. One play today, in Duke’s first loss of the season (Okafor had 23 points on 8-11 shooting, with 12 rebounds and 3 blocks) stood out as a good example. Here’s a breakdown with fuzzy pictures taken by my phone of my TV. 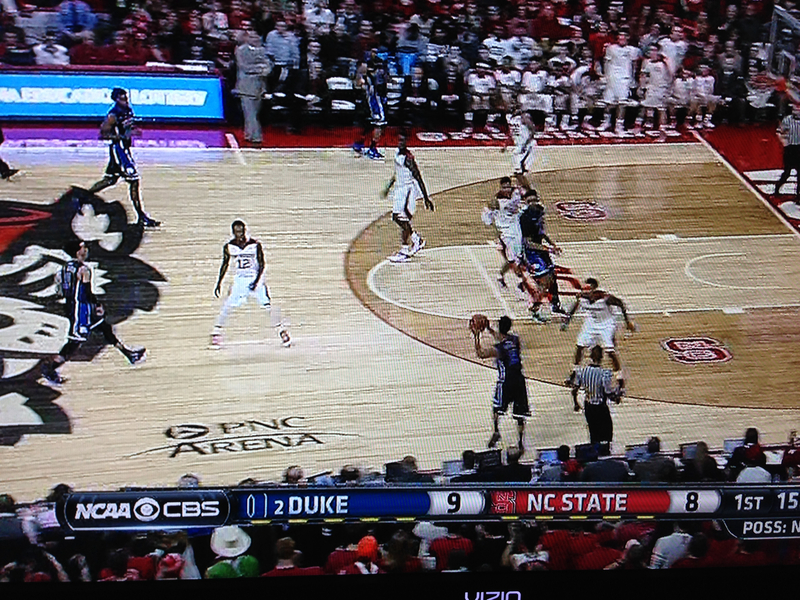 First, as Duke pushes the ball up the floor, Okafor is already feeling his man for position on the block. By doing this, no time needs to be wasted with ball reversals or screens to get him the ball on the block to start the offense.